For readers not familiar with Sri Aurobindo, we present here a brief introduction. Sri Aurobindo wrote the above as part of his reply to someone who had expressed an interest in writing the Master’s biography. Indeed, how does one speak of the outer life of Sri Aurobindo? How does one write a small note about someone who has been spoken of as a Modern Rishi, a Maha-Yogi, a sage-philosopher, a seer-poet, a political revolutionary, a visionary intellectual, an explorer and adventurer in consciousness, even an Avatar? How do we begin to know Sri Aurobindo? Really begin? The following brief sketch may open the door to a deeper seeking. August 15, 1872, Calcutta – the date and birthplace of Sri Aurobindo, the harbinger of the New Age. At the young age of seven, Aurobindo Ghosh was sent by his father to England where he studied at St. Paul’s School, London, and at King’s College, Cambridge. He excelled in many languages including Latin, Greek, French, Italian, German, and mastered the Classics and much of the Modern European Literature. As per his father’s strict instructions, he received an entirely occidental education with no contact with the culture of India. He passed the open competition for the Indian Civil Service in 1890, but was disqualified for the Service because he failed to present himself at the riding examination. He returned to India in 1893 and for the next thirteen years worked in the Princely State of Baroda, first in the Revenue Department and in secretarial work for the Maharaja, afterwards as Professor of English and, finally as the Vice-Principal of the Baroda College. During this period, Sri Aurobindo engaged in intense self-culture and literary activity. He learned Sanskrit and several modern Indian languages, assimilated the spirit of Indian civilisation and its forms past and present. During the later years of his Baroda period, Sri Aurobindo was also deeply engaged in silent political activity. But after the partition of Bengal in 1905 he quit his Baroda Service and openly joined the Nationalist movement to free India from the British colonialist rule. In 1906 he went to Calcutta as Principal of the newly-founded Bengal National College. Sri Aurobindo was the first political leader to openly put forward the idea of complete independence, Purna Swaraj, for India. He was also the first revolutionary to advocate an economic, national, educational, judicial and an administrative boycott as a tactic to fight the imperialists. He laid down clear and specific guidelines for setting up Swadeshi, a national education system, national arbitration courts, national organisation for self-government. His vision was a rare combination of remarkable idealism and practical programme of action. Prosecuted twice for sedition and once for conspiracy, he was released each time for lack of evidence. “…the next state in the human progress is not a material but spiritual, moral and psychical advance that has to be made…” (CWSA, Vol. 6, p. 572). “India must have Swaraj in order to live for the world, nor as a slave for the material and political benefit of a single purse-proud and selfish nation, but a free people for the spiritual and intellectual benefit of the human race” (p. 573). “Sri Aurobindo had left Bengal with some intention of returning to the political field under more favourable circumstances; but very soon the magnitude of the spiritual work he had taken up appeared to him and he saw that it would need the exclusive concentration of all his energies. Eventually he cut off connection with politics, refused repeatedly to accept the Presidentship of the National Congress and went into a complete retirement. During all his stay at Pondicherry from 1910 onward he remained more and more exclusively devoted to his spiritual work and his sadhana.” (CWSA, Vol. 36, pp. 8-9). In 1914 after four years of silent Yoga Sri Aurobindo began the publication of a philosophical monthly, the Arya. It was in the pages of Arya that most of his important works, The Life Divine, The Synthesis of Yoga, Essays on the Gita, The Isha Upanishad were first serialized. In addition to these works that embodied the inner knowledge realized in his Yogic practice, Sri Aurobindo also wrote several essays concerned with the spirit and significance of Indian civilisation and culture (The Foundations of Indian Culture), the true meaning of the Vedas (The Secret of the Veda), the progress of human society (The Human Cycle), the nature and evolution of poetry (The Future Poetry), the possibility of the unification of the human race (The Ideal of Human Unity). His collected poetic works include poems written in England, Baroda and Pondicherry. Having gathered into his Yoga the essential elements of spiritual experience that are gained by the old Yogic paths, Sri Aurobindo pursued his search for a more complete experience uniting and harmonising the two ends of existence, Spirit and Matter. This new path of spiritual practice, which he called the Integral Yoga, has for its aim a spiritual realisation that not only liberates man’s consciousness but also transforms his nature. Integral Yoga emphasises personal transformation as a way to act towards a deeper transformation of the evolving outer world with a goal to enable a progressive and fundamental change in individual and collective consciousness. Sri Aurobindo’s published works comprise 37 volumes, several of them having more than 700 pages and each page expressing profound truths. In addition to expressing his Yogic and spiritual revelations, his writings cover the whole gamut of human experience such as Vision for Life, Love, Beauty, Knowledge, Individual, Society, Nation, Future, World, Humanity, Divine, Everything. His Letters on Yoga in particular serve as a complete practical guide to an aspirant, and deal with practically all real-world struggles a sadhak may face on the path. Savitri, his epic mantric poem, the longest poem in English language (24,000 lines), was used by Sri Aurobindo, in his own words, “as a means of ascension… Savitri has not been regarded by me as a poem to be written and finished, but as a field of experimentation to see how far poetry could be written from one’s own Yogic consciousness and how that could be made creative” (CWSA, Vol. 27, p. 272). The more time we spend with Sri Aurobindo’s writings, reading the passages again and again, – be it his fiery political speeches or his mantric poetry, his vision for World Unity or his deep explorations into the psychological-occult significance of the Vedic hymns, his essays on Indian Art or his practical advice on human relationships in the path of Yoga – we realise that nothing has been left out, and everything has been raised to the highest level of consciousness, studied from the deepest view of reality and existence, and expanded to the widest range of possibilities and potentialities. Reading Sri Aurobindo becomes a transformative experience, on many levels. This brief introduction to the outer life of Sri Aurobindo would be incomplete without mentioning one endearing aspect of his personality, namely his amazing wit and sense of wry humour. To see this side of him, we turn to volumes such as Correspondence with Sri Aurobindo, Talks with Sri Aurobindo and Champaklal Speaks, where we find many instances of Sri Aurobindo’s charming expression and witty one-liners on topics ranging from the most mundane to the most profound. Reading these one can’t help falling in love with the Divine Master. Sri Aurobindo left his body on December 5, 1950. To read more about Sri Aurobindo, click here. 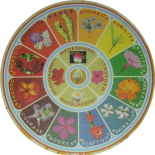 To read more about Integral Yoga, click here. To watch a film on the “Life of Sri Aurobindo”, click here. Even as an “introduction”, as you claim this to be at the outset, it is too partial and incomplete a sketch of Aurobindo Ghose. Welcome Pallav to matriwords. Happy to make your acquaintance, I just replied to your comment on Alka’s blog. I agree it is a very brief sketch of Sri Aurobindo, that’s why a link is given at the end for anyone wanting to explore more 🙂 As someone said to me once, the best way to learn more about these great seers is through their works, by studying, imbibing and putting into practice (to whatever little extent one could) their teachings into life. But of course, there are always books that can be recommended to anyone wanting to know more about the lives of the rishis. Thanks for visiting, and hope to see you again on these pages!